The military world has always shown great interest in the evolution of software and in the way it has been produced through the years. The first standard for software quality was originated by the US DOD (2167A and 498) to demonstrate the need for this particular user to implement repeatable and controllable processes to produce software to be used in high-reliability applications. Military systems rely more and more on software than older systems did. For example, the percentage of avionics specification requirements involving software control has risen from approximately 8 % of the F-4 in 1960 to 45 % of the F-16 in 1982, 80 % of the F-22 in 2000, and 90 % of the F-35 in 2006. This reliance on software and its reliability is now the most important aspect of military systems. The area of application includes mission data systems, radars/sensors, flight/engine controls, communications, mission planning/execution, weapons deployment, test infrastructure, program lifecycle management systems, software integration laboratories, battle laboratories, and centres of excellence. Even if it is slightly less significant, the same scenario applies to the land component of the armed forces. Software is now embedded in all the platforms used in operations, starting from the wearable computers of the dismounted soldier up to various levels of command and control, and every detail of modern operations relies on the correct behaviour of some software product. Many of the mentioned criticalities are shared with other public security sectors such as the police, the firefighters, and the public health system. 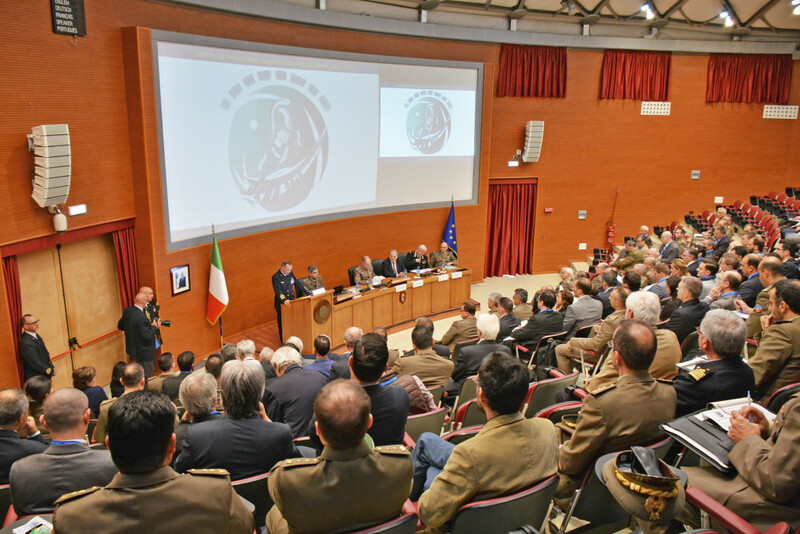 The rising awareness of the critical aspects of the described software diffusion convinced the Italian Army General Staff that a moment of reflection and discussion was needed and with the help of the universities, the SEDA conference cycle was started. For the third conference SEDA 2014, it was decided to shift the focus of the event slightly away from the traditional approach to look at innovative software engineering. Considering the title: software engineering for defense application, this time, the emphasis was deliberately put on the “defense application” part. For the first time, papers not strictly connected to the “pure” concept of software engineering, were accepted together with others that went deep into the heart of this science. The reasons for this change were first of all the need for this event to evolve and widen its horizon and secondly the need to find more opportunities for the evolution of military capabilities. In a moment of economic difficulty, it is of paramount importance to find new ways to acquire capabilities at a lower level of funding using innovation as a facilitator. It was deemed very important, in a period of scarce resources to look ahead and leverage from dual use and commercial technologies. Software is, as said, a very pervasive entity and is almost everywhere, even in those areas where it is not explicitly quoted. A mention was made to the changes in the area of software engineering experienced in the Italian Army and the starting of a new methodology which would then become “Italian Army Agile” and then DSSEA® iAgile. The LC2Evo results and analysis marked the pace of the 5th SEDA 2016 conference, the first one under coordination of DSSEA. The acronym stands for Land Command & Control Evolution and this is a successful effort the Italian Army General Staff made to device a features & technology demonstrator that could help identifying a way ahead for the future of the Command & Control support software. The main scope, related to the software engineering paradigm change in the effort, was to demonstrate that a credible, innovative and effective software development methodology could be applied to complex user domains even in the case of rapidly changing user requirements. The software project was embedded in a more ambitious and global effort in the frame of the Italian Defence procurement innovations process aimed at implementing the Concept Development & Experimentation (NATO CD&E) which was initially started by the Centro Innovazione Difesa (CID). Valuing working software over comprehensive documentation. Agile practices such as SCRUM include: planning, design, development, and testing into an iterative production cycle (Sprint) able to deliver working software at short intervals (3-4 weeks). The development teams can deliver interim capabilities (at demo level) to users and stakeholders monthly. These fast iterations with user community give a tangible and effective measure of product progress meanwhile reducing technical and programmatic risk. Response to feedback and changes stimulated by users is far quicker than using traditional methods. The User/stakeholder community in the Army is very articulated, including Operational Units, Main Area Commands, and Schools. The first step we had to take was the establishment of a governance body which could effectively and univocally define the “Mission Threads” from which the support functions are derived. The first LC2Evo Scrum team (including members from Industry) was established in March 2014. In the framework of a paramount coordination effort led by The Italian Army COFORDOT (three star level Command in charge, among other things of the Army Operational Doctrine) the Army General Staff Logistic Department got full delegation to lead, with the help of Finmeccanica (now Leonardo), a software development project using agile methodology (initially Scrum, then ITA Army Agile and finally DSSEA ® iAgile) aimed at the production of a technology demonstrator capable of implementing some of the Functional Area Services of a typical C2 Software. Strictly speaking software engineering, one of the key issues was providing the users with a common graphical interface on any available device in garrison (static office operation) in national operations (i.e. Strade sicure) or international operations. The device type could vary from desk top computers to mobile phones. The development was supposed to last 6 to 8 months at the Army premises to facilitate the build-up of a user community network and to maximize the availability of user domain experts, both key features of the new agile approach. In the second phase the initial team was supposed to move to the contractor premises and serve as an incubator to generate more teams to work in parallel. The first team outcome was so surprisingly good and the contractor software analysts and engineers developed such an excellent mix with the army ones that, both parts agreed to continue phase two (multiple teams) still at the Army premises. The effort reached the peak activity after 18 months from start when 5 teams were active at the same time operating in parallel (The first synchronized “scrum of scrum like” reported in the mission critical software area). As per the results presented at SEDA 2016 more that 30 Basic production cycles (Sprints of 4-5 weeks) were performed, all of them delivered a working software increment valuable for the user. The delivered FAS Software tested in real exercises and some components deployed in operations. One of the initial tests was performed during a NATO CWIX exercises and concerned cyber security. The product, still in a very initial status, was able to resist more than 48 hours to the penetration attempt by a very good team of “NATO hackers”. More than a million equivalent line of software were developed at a unit cost of less than 10 Euros, with an overall cost reduction of 90% reaching a customer satisfaction exceeding 90%. One of developed FAS is still deployed in Afghanistan at the multinational Command. The preparatory work for SEDA 2016 made it clear that the delivered working software and the impressive cost reduction were not the most important achievements of the Italian Army experiment. The most important result was the understanding of what is needed to set up a software development environment which is effective for a very complex and articulated set of user requirements and involves relevant mission critical and high risk components. After a year into the experience, the LC2Evo project and the collateral methodological building efforts had already substantially involved a community much wider than the Italian Army and the Italian MoD, including experts from universities, defence Industry and Small Enterprises, making it clear that there was an urgent need to preserve the just born improved agile culture oriented to the mission critical and high reliability applications. The Community of interests build around this efforts, identified four key areas called “Pillars” (explained through the conference sessions) on which any innovative agile software development process for mission critical applications should invest and build. Surprisingly (may be not) the collected indications mostly concern the human component and the organization of the work, even if there are clear issues on the technical elements as well. To act as a “custodian” of the new born methodology the no-profit Association DSSEA® took the lead of the methodology development, now DSSEA® iAgile, and of the SEDA conference cycle organization. As a result the methodology and the conference are available to developers and researchers for free. In the area of innovation and towards building a new Software Engineering Paradigm DSSEA® iAgile constitutes a real break through and for this NCI Agency (NATO Communication and Information Agency) organized two different workshops aimed at devising a strategy to introduce this methodology into the NATO procurement cycle. The DSSEA coordination in the preparation and execution of SEDA 2016 has initiated a series of collateral discussion & elaboration processes which resulted in many continuous methodological and technical efforts mainly at the Italian Directorate of Armaments Agency: DAT, at NATO NCI and at some universities: Innopolis University (Russian Federation) being the most active, University of Bologna (Italy), University of Regina (Canada) and University of Roma 1 Sapienza (Italy). It appears that this DSSEA coordination activity is capable of generating a year-round production of technical papers as a spin off of any SEDA event. For this reason it was decided to decouple the post-proceedings publication date and the conference date keeping as the only requirement to publish before the date of the next conference. Another important effect of the DSSEA coordination was the institution of the “DSSEA Innovative Software Engineering Prize” reserved to young software engineers MD Thesis (5 years course of study). The prize, consisting in 1000 Euro and the publication of a summary of the thesis has been awarded to Dr.Ing. Vincenzo Pomona from University Of Catania. Proclamation was made during SEDA 2016 by Lt. General Castrataro Co-Chair of the Conference and Prof. Paolo Ciancarini DSSEA Vice President, while the delivery was made at the DAT premises on the 13th of June 2016. The first edition of the “DSSEA Innovative Software Engineering Prize” was reserved (as experimentation) to Italian candidates only, but DSSEA plans to enlarge the competition to a wider international participation.